Picture yourself on a journey in some faraway place, it’s lunch time and you’ve decided to stop for some food. …and for some strange reason there’s no way to get utensils anywhere. 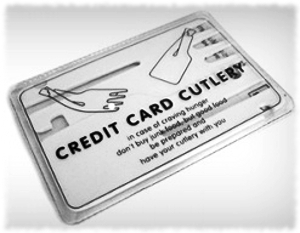 Credit card cutlery to the rescue. Maybe. Really this situation’s not such a bad thing, you’ve been waiting for this moment ever since you bought your very own Credit Card Cutlery. 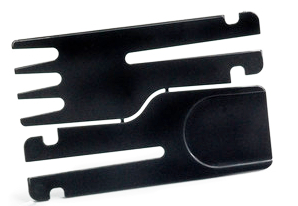 Though it might be roughly the size of a credit card this is no ordinary piece of plastic. 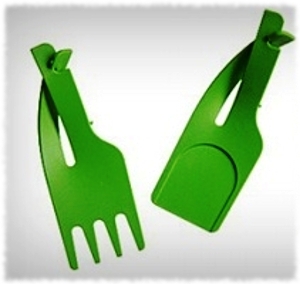 Snap it apart and it separates into two funky shaped pieces of plastic that can be contorted into a fork-like thing and a spoon-like thing. Theoretically at this point you contort the plastic into the right shapes and then use it to easily eat your soup and salad. Not sure if that would really be the case if it happened in real life though. The spoon is the one that I feel the least confident about, as it’s more of a paddle or a shovel type of utensil. Also not sure if it would actually hold a bit of soup, but maybe you could life the bowl to your mouth and use the spoon to paddle the soup in or something. The fork I’m a little more confident about, especially if you’re using it for food that is easily pierced. A hearty salad might be a pain to eat with this fork but I’m guessing it’s doable. Overall my guess is it’s probably not super enjoyable to eat with these after the novelty wears off in roughly 30 seconds or less. Seems more like something that a design student would get a good grade on, but not something that would be particularly practical in real use. Maybe I’ll try this someday just for fun and see if it works out better than I think it will, but I’m guessing not. On the upside though you could just stick it in your wallet and forget about it. If you ever find yourself in the position of needing a fork or spoon shovel with no other way to get them, then this would at least be better than nothing.